How do you feel about transition? Do you look forward to change or are you more comfortable with things staying the same? Or perhaps like me, you feel every which way. When summer ends, I certainly regret shorter, colder days, but I have to say I look forward to snuggling up in front of a fire with my sweetheart or feeling toasty in tall boots and a cashmere sweater. This year after moving from California to Seattle, I have to think more seriously about adding transitional garments to my closet. Although doing so seemed daunting at first, I have come up with several ideas after some recent street-style-watching. 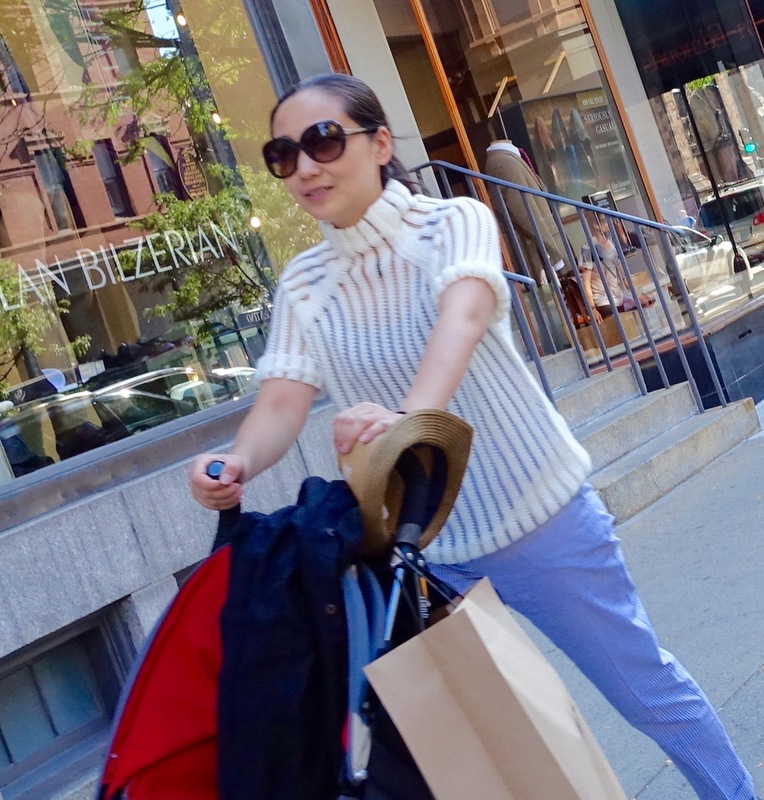 Here are some great looks I spotted in Boston and New York this week. The two muses pictured above have given me new reasons to keep wearing shorts – especially during an Indian summer! Some of this year’s autumn trends are awesome, but I always love classic leather. And paired with shorts, it is a sassy, fun answer to trans-seasonal dressing. When temperatures get cooler, booties are a great option for footwear. Thinking you might shop for a leather-front sweater? You can find one here, here, and here. The dress pictured above appeared several times last weekend on Boston’s fashionable Newbury Street. For those preferring something a little trendier and willing to put gams on display, it is a fantastic choice. These long-sleeved LBDs are the perfect transitional attire, allowing you to cover up one area while exposing another. Shop the dress here, here, here, and here. Faux leather skirt in Boston; military-style booties in New York. Sometimes even though it still feels like summer out, one simply gets bored of her summer clothes. How about a fall-appropriate, PETA-approved faux leather skirt? I love the combination of a 1950s retro cut with a shininess which gives the skirt a futuristic flair. And speaking of shiny, aren’t the moto-style booties to the right a great combination of edginess and warmth? Find a similar faux leather skirt here, here, and here. Moto/combat booties can be found here, here, here, and here. A semi-transparent ribbed sweater donned in Boston reminds me that it is the perfect time to wear sheer tops and sweaters – not too warm, not too cold. The muse above tastefully wears her sweater over a tank matching her trousers. With a black version of the sweater, a matching tank or bandeau top would keep it decent for daytime, while for going out, a black or colored bra gives it a flirty vibe. If you want to shop sheer sweaters, look here, here, here and here. As Liliya did in a recent #OOTD post, the muses above and below demonstrate how to look cool and chic in a garment which screams transitional: the jumpsuit. A soft, silky fabric steers it free and clear of “house painter” territory, while bejeweled sandals with a thick, flat heel give it a hint of androgyny. Booties (my preference are for a fem medium- to high-heel) and short leather jacket (bright red perhaps) would carry this jumpsuit even further into fall. 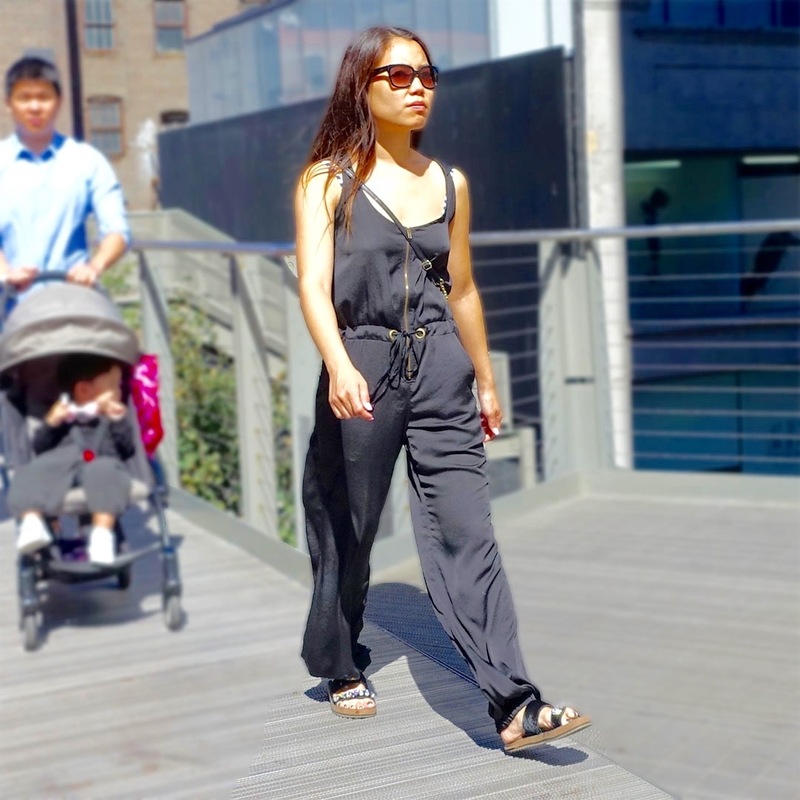 Find a similar jumpsuit here, here, and here. The muse in an olive green jumpsuit creatively balances contrast (bright red watch and necklace) with matching tones (of the sneakers). You can shop a long-sleeved jumpsuit here, here, here, and here. A black and white patterned iPhone case shows this woman’s attention to style detail – bravo! The ensemble of our final muse from New York is not only trans-seasonal but also classic. Audrey Hepburn’s aura is channelled through a loose button-down blouse (sleeves rolled up above the shoulders to help with petite proportions), soft midi-length A-line skirt, and wide leather belt. The thong sandals are a modern but lovely adaptation for warmer days. It can be tricky sometimes to find the right outfit when weather is unpredictable or else, mornings are cool, afternoons are balmy, and temperatures drop once again in the evening. I hope that you have been able to take a few cues from the stylish muses above. A cousin of mine in Norway tells me, “There is no bad weather, just inappropriate clothing.” Let’s embark together on a search for ways to stay comfortably dressed for the weather – in style! How can this people seriously look so cool like these,street style is the best,xoxo BING.